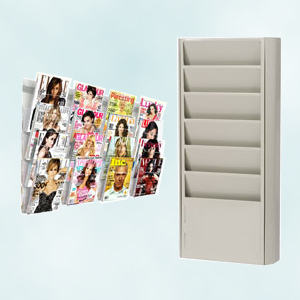 Why use wall magazine racks in your office, business, or public building? These professional hanging literature holders help to increase awareness of your company wherever they are used. The wall magazine racks for newspaper or periodical storage are available in several materials to allow customers to choose the best option for their modern or traditional space. The wood displays made of oak are great for locations that have more conservative look because of their classic styling. The wall magazine racks, like hanging literature holders, are also made of steel and other metals in more modern shapes like wave mounts to add interest to everyday organizers. Clear plastic and acrylic displays are sold for owners that want durable pockets that are able to be mounted anywhere and instantly blend in with existing décor. These hanging literature holders for office use can really be placed in many settings because they are so versatile. There are many single and multi-pocket organizers for sale so there is no doubt you will find the perfect mounted brochure display. What are some of the similarities between these 4 styles of hanging literature holders? These wall magazine racks are made of durable materials and designed to last through years of use no matter the settings where they are placed. These organizers, whether wood, plastic, or acrylic, are all available as single holders or multi-pocket organizers. While the metal and steel literature displays do not come in one-slot styles, they do have plenty of mounted units available. The magazine racks are also sold with many available color or finish options. The oak holders are sold in light, medium and red mahogany finishes for a good variety offered to customers. The metal storage units come in black, brown, and silver choices and these are where the bulk of the modern wave mounts are found. While the clear acrylic and plastic mounted brochure displays are transparent, there are models with black backers added for elegance. These wall magazine displays are used in many places, like schools and offices, and for many different purposes from retail literature displays to newspaper organizers. These holders can be seen in doctor’s waiting spaces to keep periodicals and flyers neat and tidy for patients and the wood versions may even be used next to exam rooms to hold charts for easy access by medical practitioners. The magazine racks of metal, plastic and acrylic may be mounted brochure displays and have a mix of literature that can be presented to customers or patrons in retail storefronts. These categories also feature our wave mounts with some displays having the ability to house larger graphics too, which are perfect showroom fixtures because of their promotional abilities. There are wall magazine displays that are oak and perfect for using in restaurants to hold menus for servers or mounted next to a bar or counter to keep a communal newspaper for customers. Some of the steel units are great for school placement, not only because they are durable and affordable, but because they have many pockets used as storage for various parent and student forms. These organizers are often tiered too and so they take up a little space as possible on walls for the ability to also mount paintings, photographs or other important information. The affordable clear displays are some of our best sellers because they are able to fit into the budget of any business large or small!